Kings Bay Naval Submarine Base is the state-of-the-art home to the Atlantic Fleet's Trident II Submarines. Kings Bay borders the historic town of St. Marys, Georgia in the southeastern corner of Coastal Georgia, just north of the Florida border. As an integral part of our nation's strategic deterrence program, Kings Bay has attained and sustained award-winning results unsurpassed in Navy Region Southeast or other submarine and shore commands in the U.S. Navy. In 2007, Kings Bay was named the top naval installation in the Department of Defense receiving the Commander-in-Chief's Installation Excellence Award for its ability to sustain its mission, increase productivity and enhance the quality of life. The award also recognized the base's creative management, new ideas, and leadership. Kings Bay also received the Occupational Health and Safety Administration's highest safety rating in the Voluntary Protection Program and the Secretary of the Navy and Chief of Naval Operations Safety Ashore Award for the third consecutive year. NSB Kings Bay' mission is to provide support to the Fleet, Fighter, and Family. Naval Submarine Base Kings Bay has three major commands: Trident Training Facility (TTF), Trident Refit Facility (TRF), and Strategic Weapons Facility, Atlantic (SWFLANT). In addition, this installation is the homeport of five Ohio-Class TRIDENT submarines and two guided missile submarines, the USS Florida and the USS Georgia. Kings Bay borders the cozy historic town of St. Marys, Georgia, in Camden County. Camden County lies in the southeastern corner of Coastal Georgia, just north of the Florida border. The main towns in Camden County are St. Marys, Kingsland and Woodbine. Woodbine, eighteen miles northeast of the Base, is the county seat. Kings Bay is approximately three miles from Georgia State Highway 40; five miles from Interstate 95; and 30 miles north of the Jacksonville, Florida Airport. You can reach the Naval Submarine Base by Interstate 95. You may take Exits 1, 3, or 6. Exit 1 takes you down St. Marys Road and ends at the Franklin Gate. From Exit 3, take Georgia State Route 40 east to St. Marys and turn east onto Kings Bay Road, which ends at Stimson Gate. The 6 Exit also leads to Kings Bay Road and to the Stimson Gate. 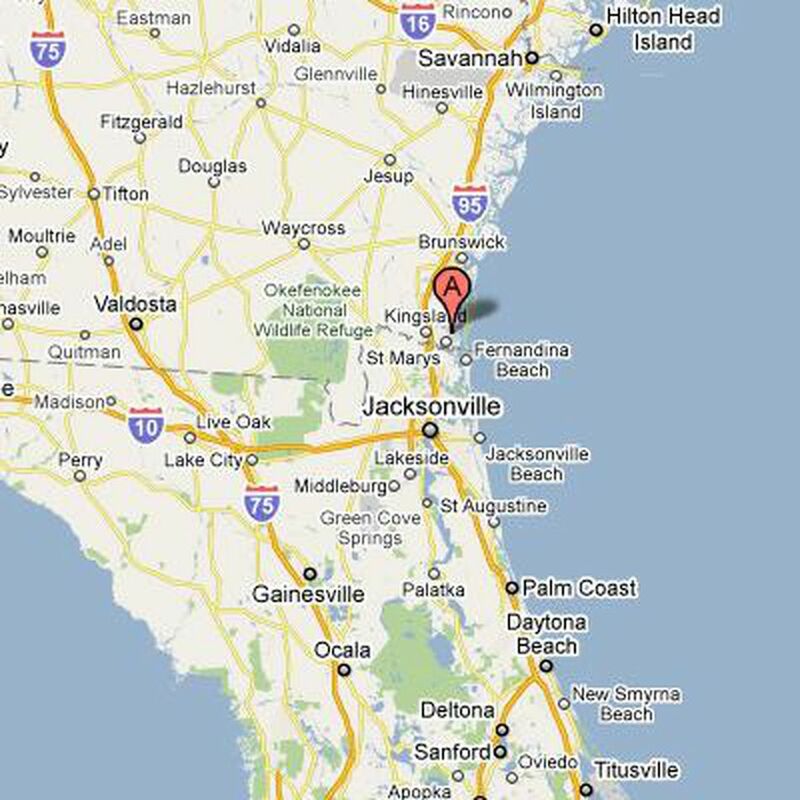 For those traveling by air, the closest airport is Jacksonville International Airport, located in Jacksonville, FL. The airport is approximately 35 miles south of the base, down Interstate 95. Cab fare from the airport is approximately $40.00. Contact your Command Sponsor for arranging transportation from the airport to the installation. For those traveling by rail, AMTRAK has a terminal located in Jacksonville, FL., approximately 45 miles south of the base, down Interstate 95. Cab fare from the train station is approximately $50.00. Contact your Command Sponsor for arranging transportation from the train station to the installation. NSB Kings Bay base is home to Submarine Group 10, Submarine Squadrons 16 & 20, Trident Training Facility, Trident Refit Facility, Strategic Weapons Facility Atlantic, and other support-providing commands. The Kings Bay community consists of DoD personnel and their families, civilians, contractors, and visitors from NATO countries. The NAVY LODGE located at Building 0158 1290 USS Jackson Rd, has a total of 25 guest rooms, 1 configured for handicapped occupants, all with kitchens. Twenty-four-hour phone service is available. All Navy Lodge rooms are non-smoking. The Navy Lodge offers daily Breakfast to Go Bags. The Lodge is exactly 2 miles from the Navy Exchange Retail Complex. The Transient Visitors Quarters, now the Navy Gateway Inns and Suites offers rooms for service members and their families under PCS Orders, transient personnel under orders (TDY, TAD, or TEMDUINS) and space available. Normally a family under PCS Orders may stay for up to 10 days when transferring into the area and 30 days when transferring out. Service members under PCS Orders transferring into the Kings Bay area from outside the Continental United States, cannot stay at the TVQ and are directed to stay at the Navy Lodge. Rooms include a microwave, refrigerator, iron, ironing board, cable TV, VCR or DVD player, full-size beds, and sleeper sofas. Suites also include a kitchenette; a full-size kitchen is available to all guests as well as a small conference room. Pets are not authorized in the TVQ. The TVQ is within walking distance to the Galley, Navy Exchange, Commissary, and Fitness Center. There is a 25% increase for each additional person up to 2 extra people. Reservations may be made and current rates obtained by calling the Front desk 24 hours. Sixty RV sites reside inside the MWR Kings Bay RV Park. Each site has a 20'x40' paved pad, water, sewage, 30 & 50-amp electrical hookups, a picnic table, and fire ring. Single service members, E4 and below assigned to SUBASE or tenant commands, are required to live in Bachelor Quarters. Single members E5 and above may elect to draw BAH if they meet the criteria in SUBASEINST 10110.1K, policy for granting Single Basic Allowance for Housing (SBAH). Geographic Bachelors are not housed in Bachelor Quarters. The Enlisted Bachelor Housing complex consists of 1174 rooms and can house 1684 enlisted personnel. E1-E4 shares a room and private bath. E5 and above have a private room/bath. In-room phone service is available from ATT. In-room cable service is available from Comcast Cable Company. Laundry rooms are available 24 hours a day for resident use only. Smoking is allowed in designated areas only. Service members must o go to the Navy Family Housing office to complete their application. The Navy Family Housing Office will determine your entitlement (number of bedrooms) and you will be referred to the Community Management Office for the actual assignment. All service members who are transferring to the Kings Bay area, with or without dependents, are directed to contact the Navy Housing Office before making any off-base housing commitments. Kings Bay Naval Submarine Base is one of the many Navy Installations to have privatized family housing. Southeast Housing LLC (Owner), a partnership between Balfour Beatty Communities and the Navy, is proud to take care of Residents’ housing needs. The 645 homes at Kings Bay are surrounded by quaint getaways and a welcoming southern atmosphere. There are no DDOS schools on the base. The local school district has worked diligently to assist military families as they transfer to this area. The Camden County School System consists of fourteen schools. There are nine elementary schools which house grades Pre-K through 5; two middle schools which house grades 6-8; one high school with grades 9-12; a special needs school; and an alternative school. Georgia Law requires the following in order to enroll in the Camden County Schools: (1) An Official Copy of the Child's Birth Certificate (a copy can be made from the original at the school); (2) An Official Certificate of Immunization (Georgia Form 3032); (3) An Official Certificate of Eye, Ear and Dental Examination (Georgia Form 3300); and (4) Social Security Card of the Student (Optional). The following will be helpful but not immediately required to enroll: (1) Permanent records, cumulative folder; and (2) Health records. If your child is receiving SPECIAL EDUCATION SERVICES, you should bring a copy of (1) Psychological evaluation; (2) Current IEP; and (3) Current testing results other than the psychological. Students entering the Camden County Schools for the first time, regardless of grade level, must have been immunized against diphtheria, measles, mumps, polio, rubella, tetanus, and whooping cough prior to admission. Parents are responsible for seeing that their children are properly immunized in accordance with the law. Dosage requirements: 3 DPT - last one to be given after 4th birthday 3 Polio - last one to be given after 4th birthday The State of Georgia requires 2 MMR's be given before entering the 6th grade. The Child Development Center (CDC) at Kings Bay offers full-time care for children six weeks to five years old. All military and DoD employee family members are eligible for enrollment. The CDC has the capacity to enroll 282 children. The center maintains a waiting list for each age group. A copy of the waiting list can be faxed or e-mailed to you by calling 912-573-9918. The Child Development Center program has three state-funded Pre-K classes that serve 60 children who turn four years old by September 1st of each year. Instructional Day for Pre-K is Monday to Friday: 8 a.m. to 2:30 p.m. Before and after care is provided if necessary for a fee based on total family income. Morale, Welfare and Recreation's Child Development Homes (CDH) is a Navy-wide program which offers quality child care in a home environment. Child Development Home providers are not babysitters. They are childcare professionals who offer an age-appropriate curriculum designed to meet the physical, social, emotional, and physical growth of each child. Providers set their own work hours and schedule their own vacation times during the year. For more information call 912-573-2538. The Youth Center of Kings Bay offers a variety of leisure programs for youth and teen, kindergartners through 18 years of age. Among the various programs offered include School Age Care (SAC), Day Camp, and Teen Supreme. There is no major medical facility located on the Naval Submarine Base, Kings Bay. There is a clinic, which does not offer an Emergency Room. All patients, including Active Duty personnel, requiring emergency care should go to the nearest Emergency Room or call 911. Active duty Service Members need to follow up with their PCM the next business day for follow up and to ensure proper referrals are written in order for the bills to be paid correctly. Family Members using Tricare Prime need to follow up with their PCM within 24 hours. After clinic hours, the nearest military treatment facility is the Naval Air Station, Jacksonville, Florida.